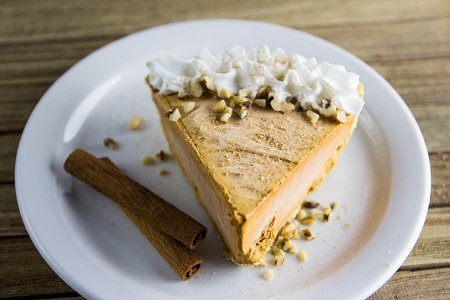 Our popular no-bake Pumpkin Chiffon Cheesecake mixes combine classic pumpkin pie flavor with creamy cheesecakes. They're a sophisticated twist on a classic flavor. Delicious and easy to make—just add milk, mix and chill. Whipping Base (Partially Hydrogenated Coconut Oil &/or Palm Kernel Oil, Corn Syrup Solids, Sodium Caseinate, Propylene Glycol Monoesters, Lactic Acid Esters & Sodium Aluminate), Bakers Cheese (Nonfat Dry Milk, Lactic Acid, Cultures), Maltodextrin, Polydextrose, Cream Cheese Powder (Cheese, Sodium Caseinate, Disodium Phosphate, BHA), Sour Cream Powder (Sour Cream, Cultured Nonfat Milk, Citric Acid, Tocopherols, Ascorbyl Palmitate), Modified Starch, Cinnamon, Tetrasodium Pyrophosphate, Pumpkin Pie Flavor, Cream Cheese Flavor, Carrageenan Gum, Caramel Color, FD&C Yellow #6, FD&C Red #40, FD&C Blue #1, Cellulose Gum, Sodium Alginate, Sucralose, Acesulfame Potassium.